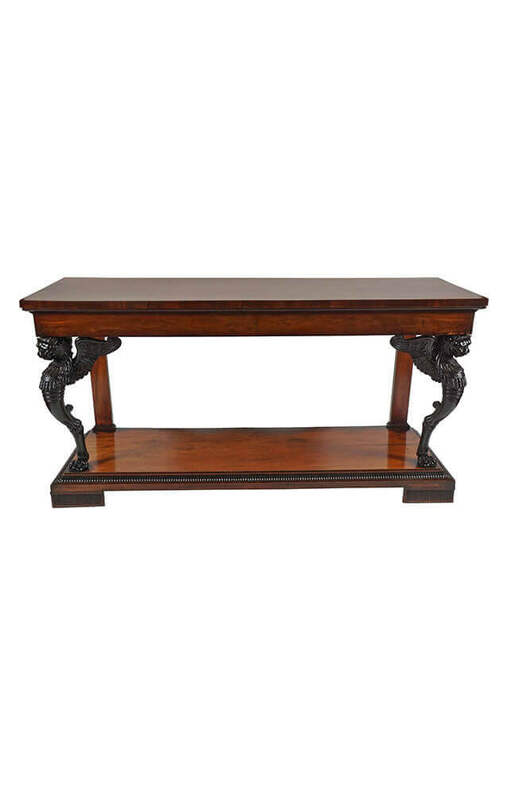 An important and exceptional early English Regency period mahogany side table, serving table, or sideboard of significant size in the manner of Thomas Hope of rectangular form having blunt-edge top above 'echinus' and stepped fillet molding with flat frieze surmounting flat pilaster supports at rear with stepped plinth capitals and bases and front supports in the form of carved and ebonized winged beasts, or 'chimera' monopodia joining lower platform with ebonized convex reeded molded edge with acanthus carved corners above reeded tablet panel-form feet. Biography of Thomas Hope: Thomas Hope (1769–1831) was influential as a designer, design reformer and collector. A Dutchman, born in Amsterdam, Hope inherited from his family a tradition of collecting as well as vast wealth from the family bank. He was a collector on a grand scale and also an innovative designer of great genius who helped define what we understand as the Regency style. 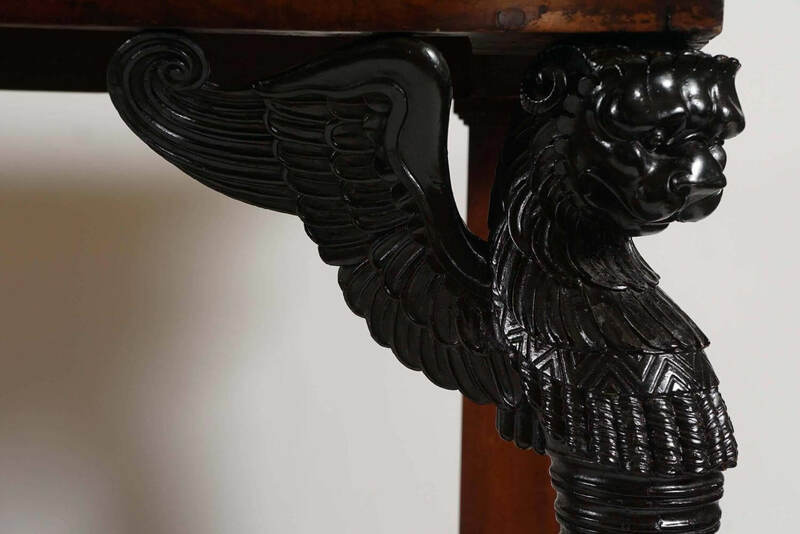 His extensive Grand Tour travels in Europe, Greece, Turkey and Egypt inspired his interest in antiquities as a source of designs for Regency interiors, furniture and metalwork. He was determined to reform contemporary taste by returning architecture and the arts, including interior design and furniture, to what he conceived as the spirit of classical purity. In 1799 he bought a house designed by Robert Adam in Duchess Street, Portland Place, London, which he remodeled with a series of themed interiors. The colourful interiors of Duchess Street and of Hope's country house, Deepdene in Surrey, played a unique role in the history of collecting, interior design and display. Both were open to select visitors, but his furniture reached an even wider public through his book, Household Furniture and Interior Decoration. Published in 1807, this book introduced the term 'interior decoration' into the English language. Hope's influence continued long after his death, partly because of his book. His designs appeared in trade journals and books on interior design, and though the Duchess Street house was demolished in 1851, its contents were taken to The Deepdene where they remained accessible to the public. In 1917 his collection was dispersed in a great sale at The Deepdene. This led to a renewed interest in Hope's achievement, for objects designed by him were bought by collectors and museum directors in Europe and the USA, so reaching a wider public. Hope's style influenced the Regency Revival of the 1920s and '30s, and even Art Deco design. The novelty and quality of his furniture and interior design have been admired from his death to the present day. Source: Thomas Hope & the Regency Style, 2008 Exhibition Literature, Victoria and Albert Museum, London. In addition to Thomas Hope, George Smith published in 'A Collection of Designs for Household Furniture and Interior Decoration', 'J. 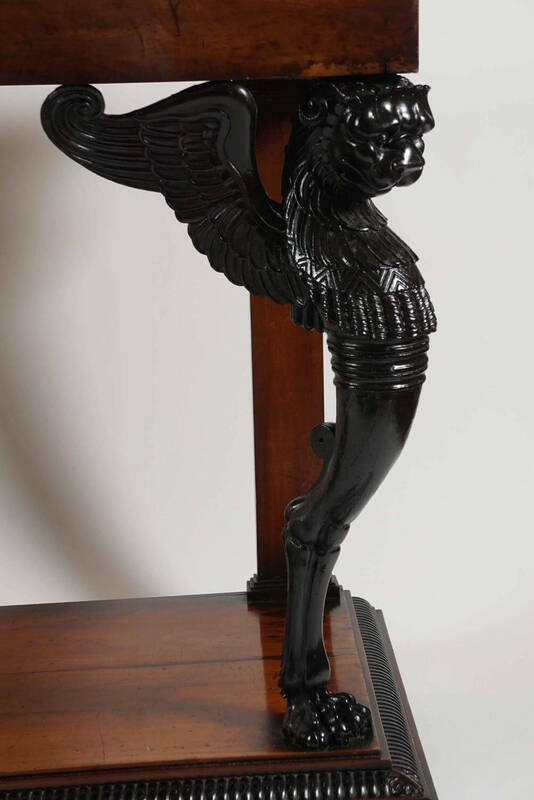 Taylor', London, 1808, a very similar leg design, however less detailed, in plate 91, entitled "Legs for Sideboards". Literature: Frances Collard, 'Regency Furniture', 'Antique Collectors’ Club', 1985, pp. 86-131; 204-220. Susan E. Stuart, 'Gillows of Lancaster and London', 'Antique Collectors’ Club', 2008, p. 324. Thomas Hope, 'Household Furniture and Interior Decoration', 'Alec Tiranti', London, 1970 reprint of 1807 first edition. 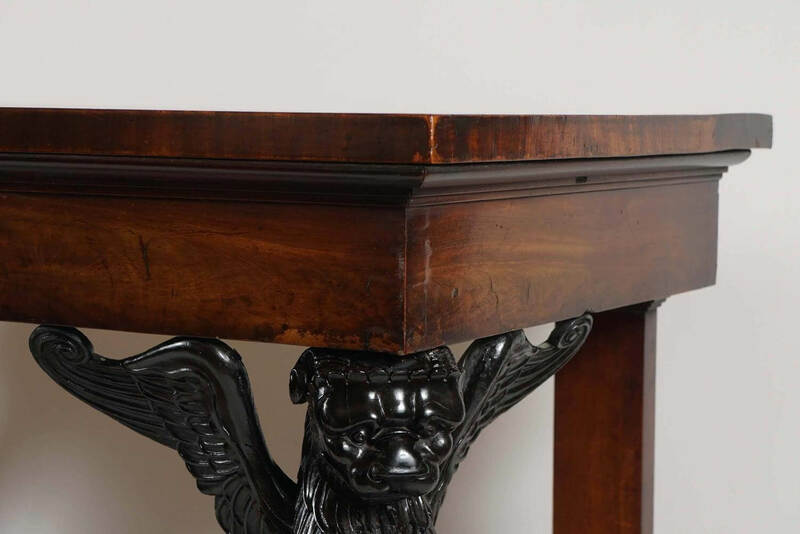 An important and exceptional early English Regency period mahogany side table, serving table, or sideboard of significant size in the manner of Thomas Hope of rectangular form having blunt-edge top above ‘echinus’ and stepped fillet molding with flat frieze surmounting flat pilaster supports at rear with stepped plinth capitals and bases and front supports in the form of carved and ebonized winged beasts, or ‘chimera’ monopodia joining lower platform with ebonized convex reeded molded edge with acanthus carved corners above reeded tablet panel-form feet. Biography of Thomas Hope: Thomas Hope (1769–1831) was influential as a designer, design reformer and collector. A Dutchman, born in Amsterdam, Hope inherited from his family a tradition of collecting as well as vast wealth from the family bank. He was a collector on a grand scale and also an innovative designer of great genius who helped define what we understand as the Regency style. His extensive Grand Tour travels in Europe, Greece, Turkey and Egypt inspired his interest in antiquities as a source of designs for Regency interiors, furniture and metalwork. He was determined to reform contemporary taste by returning architecture and the arts, including interior design and furniture, to what he conceived as the spirit of classical purity. In 1799 he bought a house designed by Robert Adam in Duchess Street, Portland Place, London, which he remodeled with a series of themed interiors. The colourful interiors of Duchess Street and of Hope’s country house, Deepdene in Surrey, played a unique role in the history of collecting, interior design and display. 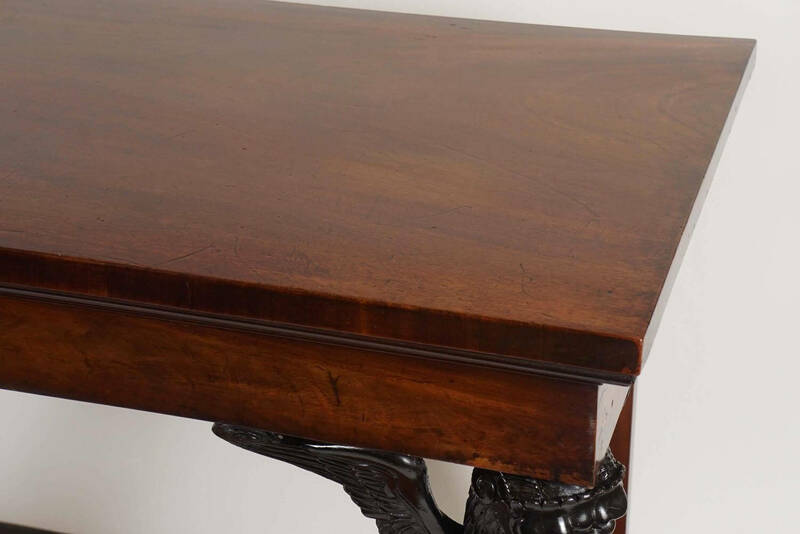 Both were open to select visitors, but his furniture reached an even wider public through his book, Household Furniture and Interior Decoration. Published in 1807, this book introduced the term ‘interior decoration’ into the English language. Hope’s influence continued long after his death, partly because of his book. His designs appeared in trade journals and books on interior design, and though the Duchess Street house was demolished in 1851, its contents were taken to The Deepdene where they remained accessible to the public. In 1917 his collection was dispersed in a great sale at The Deepdene. 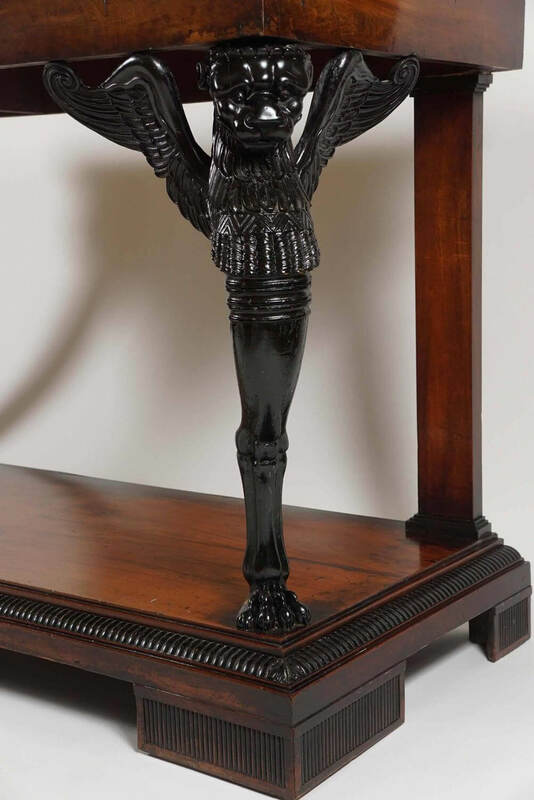 This led to a renewed interest in Hope’s achievement, for objects designed by him were bought by collectors and museum directors in Europe and the USA, so reaching a wider public. Hope’s style influenced the Regency Revival of the 1920s and ’30s, and even Art Deco design. The novelty and quality of his furniture and interior design have been admired from his death to the present day. Source: Thomas Hope & the Regency Style, 2008 Exhibition Literature, Victoria and Albert Museum, London. In addition to Thomas Hope, George Smith published in ‘A Collection of Designs for Household Furniture and Interior Decoration’, ‘J. 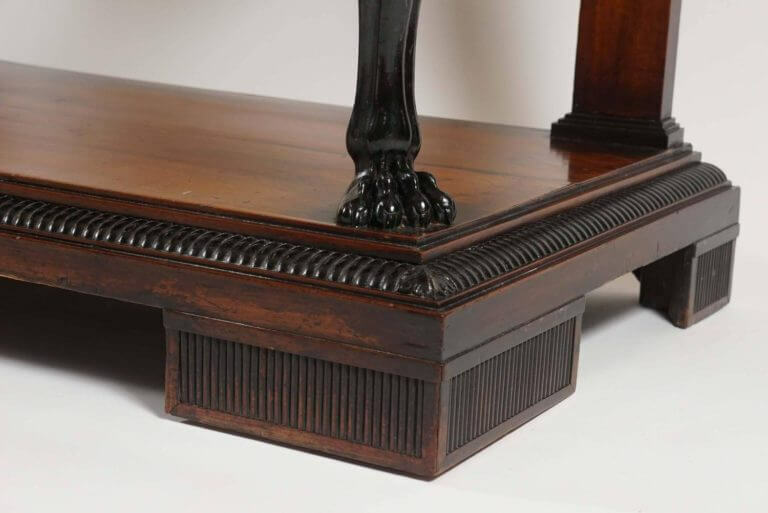 Taylor’, London, 1808, a very similar leg design, however less detailed, in plate 91, entitled “Legs for Sideboards”. Literature: Frances Collard, ‘Regency Furniture’, ‘Antique Collectors’ Club’, 1985, pp. 86-131; 204-220. Susan E. Stuart, ‘Gillows of Lancaster and London’, ‘Antique Collectors’ Club’, 2008, p. 324. Thomas Hope, ‘Household Furniture and Interior Decoration’, ‘Alec Tiranti’, London, 1970 reprint of 1807 first edition.